Coal is the largest source of energy for the generation of electricity worldwide. And coal further processing products have important role in modern industry, such as coke, ethanol production, coal gasification production, and so on. In order to improve the effective of coal using, coal briquette is usually crushed or pulverized into small block before burning of processing. For example, when coal is used for electricity generation, it is usually pulverized and then combusted (burned) in a furnace with a boiler. In the coal crushing or pulverizing process, the coal crusher is necessary equipment. The common coal crushers can be divided stationary coal crusher and portable coal crusher. Stationary coal jaw crusher: Jaw crusher is the primary crusher in stationary coal crushing process. Jaw crusher features high crushing ratio, stable performance, high efficiency, simple structure, easy maintenance and so on, which is widely used in coal mining, construction, building, cement industry and so on. Stationary coal cone crusher: Cone crusher is the secondary crusher in stationary coal crushing process. Cone crusher is suitable for hard and mid-hard rocks and ores, which has four types: HPC cone crusher, CS cone crusher, Spring cone crusher and HCS90 cone crusher. Stationary coal impact crusher: Impact crusher can be used as secondary crusher or territory tertiary crusher in coal crushing process. The most outstanding advantage of impact crusher is that its finished powder is in good, cubic shape and without tensility and cranny. 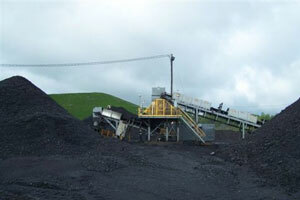 The features of these types of portable coal crushers are similar to stationary crushers, excepting its convenience.